Healing: A Bowl Full of Grains! You take every precaution, those of us with celiac disease and our family members understand the importance of clean; clean everything to prevent cross contamination. I never just buy anymore, now trips to the market include me asking “how gluten free is it”? Meaning is this item prepared in a GF designated area? Is there flour in the air? Do the employees know safe food handling procedures? I hate this, I am usually easy going. Having to ask a thousand questions before buying or eating goes against every grain in my body. You would think that after 2 years and extreme illness it would be easier; but it’s not! So I asked and I was told “yes we understand celiac disease, in fact many celiac’s order from us. All GF products are made first, wrapped and put away before other baking begins”. Now if you were like me and everyone else before diagnosis; had wheat flour in your house, you understand how difficult it is to clean away. So why did I trust the smiley faced youth? Because he said the magic words “celiac’s have been coming to us for years”. Was this a line? I am trusting by nature. I completely, one hundred percent believed him! I bought my tart happily and never gave it a second thought. That is of course until I found myself on the floor of a public washroom, dizzy, vomiting and in pain. Yesterday I was glutenized! Today my stomach is still slightly off, so I have prepared a healthy, hearty, tummy friendly, one-pot grain bowl. 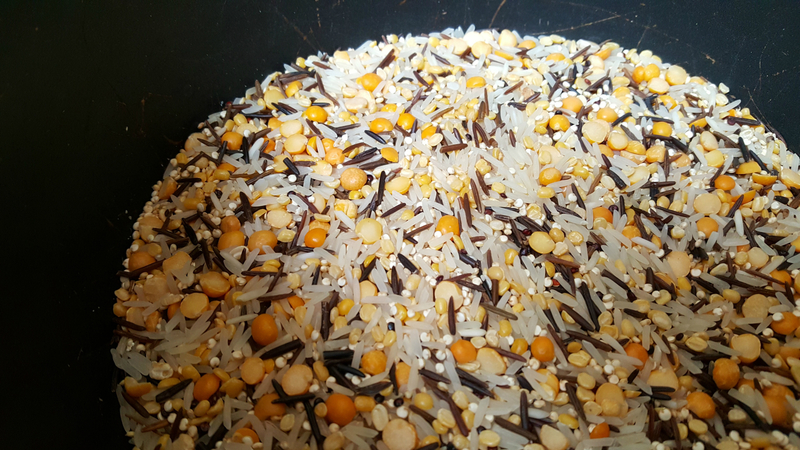 Basmati and wild rice with lentils, quinoa, carrots and beans. Packed with protein, fibre, folate and minerals; this gluten free super grain is also easy to digest. After a bout of glutenization (i love making up gluten related words) I always look for nutrient rich foods to get my system back to normal as quickly as possible. A rich source of fibre, protein and micronutrients; also easily digestible. I want the fibre to help move the gluten out of my system sooner rather than later! 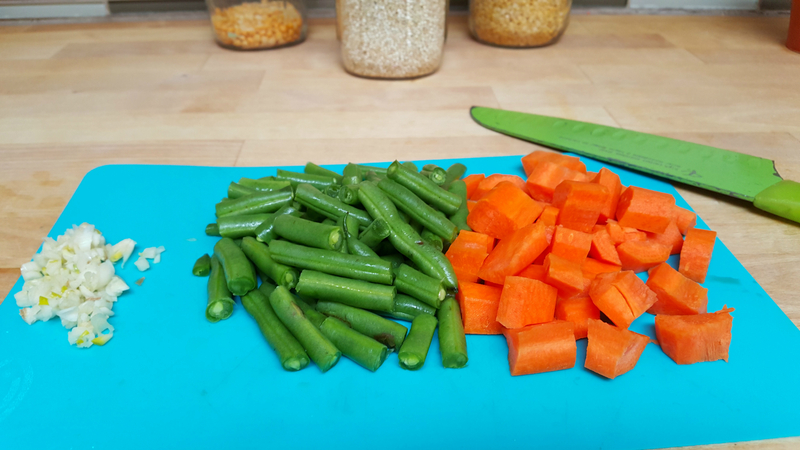 Beta-carotene, vitamin K and vitamin B6, coupled with their sweet flavour make carrots an awesome addition to any meal. Honestly, its the colour i love, how can you not smile when you see that brilliant orange peaking out of the bowl. This east Indian, aromatic rice has a low to moderate glycemic index as compared to other white rice varieties; making it easier on the body. In the delicate aftermath of a gluten related incident blood sugar spikes can cause massive headaches. So this low key rice variety is just the answer. In reality this is just an added bonus; I grew up on basmati, until I was a teen I had no idea basmati wasn’t “normal” rice. An old east Indian stomach remedy was a dish called kitcheri (lentils, rice, butter and spices) anytime my tummy acted up my Nana would have a pot of soft kitchari ready to ease my troubles. Now that I have a family of my own our house is stocked with many varieties but when the family or myself are ill nothing else will do. These ingredients are the basis of my tummy soothing, soul quenching dish. Let’s get to it! Clean and dice garlic cloves. Chop carrots to bite sized pieces. And prep any other vegetable you care to add. Secrete? Okay I cheat! Yep I take the easy road when it comes to rice; I use my trusty rice cooker. So easy, place all ingredients in and forget about it until it “pops”! Don’t have one? No problem; read on! Place cleaned rice, lentils and quinoa in the pot of a standard rice cooker. Fill the rice cooker with vegetable broth up to the 2 cup mark on the “other rice” setting (not brown rice). Add in the vegetables and garlic. Give a stir to evenly mix all ingredients. Put on the lid and turn on! When the cooker “pops” you are ready to serve. I add fresh basil to my bowl but this is completely optional! Vegetables, rice, lentils and quinoa get a quick mix in the broth. Clean and rinse grains and lentils. Place all ingredients in a pot with a tight fitting lid. Add in 2.5 cups of vegetable stock (or stock of your choice). Place lid on pot and simmer on medium to medium-low. Check after 10 minutes then again every 5 until rice is tender. Note: For both cooking methods the lentils will be al dente. If you prefer them cooked more soak them for about an hour prior to cooking.